Facebook Like-Button - hide count? The Like button coded to show "Recommend" is 84px wide and the "Like" button is 44px, will save some time for you CSS guys like me who need to hide how unpopular my page currently is! I put this code on top of my homepage, so initially I don't want it to advertise how few Likes I have. Just encompass the iframe in a div set the width to the width of button, set overflow to hidden i.e. It is now officially supported by Facebook. Just select the 'Button' layout. Due to a change Facebook recently made in the way comment dialogs display, we had to change how we were hiding it. The way they show the comment dialog has been 'moving' the content inside of the my overflow:hidden element so that the button looks really odd to the user after they click the like button. We're still using the fb:like markup though. 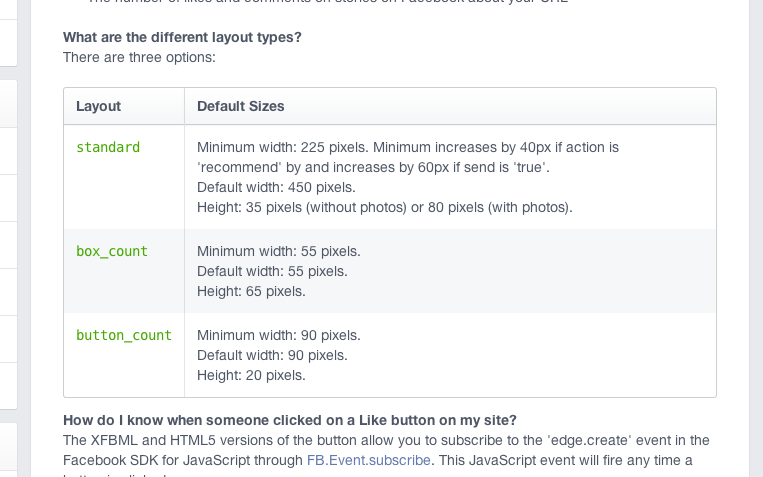 I have not tested this with the new div-based markup that Facebook is providing on their site now. I know many solutions have been posted already, but mine is still somewhat different. It works for the HTML5 Version of the like button and only uses css to hide the count box. Don't forget to add the appId to test. It seems as if FaceBook has recently changed some code - whenever I clicked "Like", the contents jumped to the left, thus messing up the UI. No CSS / JS tricks made it work. I went with a more simple solution, using an iframe. NOTICE - Though some devices already support iFrames, not all mobile devices do. iFrames are actually old and not recommended at all, but it did the trick for me. Go for the "Box_Count" style, with a counter on top. Now lets wrap a div around there. And make it so that it is always english, by adding "&locale=en_US" to the URL. This is to prevent weird layouts in other countries - in Dutch it would be "Vind ik leuk" and in english "Like". I guess everybody, in every language, knows a "Like" so lets stick with that. And now i have a decent, small, like box, that works fine and doesn't jump around. Let me know how this works out for you and if there are any problems that you are facing. Most of the suggestions are now, no longer valid. The correct fix as of today, is to use the 'button' layout. The FB Docs, seem not to be fully updated yet... if you scroll down you'll see they state only 3 layouts are available, yet the dropdown suggests 4. This means you can now use a less hacky solution! My solution is a little hood but it works. What I do is just basically detect where the number is going to be and use css to have a box cover over it. I guess you can also cheat the system and add more hits if you want. Here is my code using jquery but it will be different than others depending on where you place the like button on your page. Not the most glamorous but hey the security is to tight to manipulate content in side of a frame. Try using a different approach. All you need to do is edit the iframe code that facebook gives you and change the width to 47 (you need to change it in 2 places). Seems to work perfectly for me so far. How can I remove the 'people like this' message next to facebook like button?